Look, if I drop $3,000 on a bike, I expect its biggest limitation to be me. I’d be appalled by a $3K bike that isn’t excellent. And it made me think of how a bike can be the smallest part of the mountain bike experience. I started to think about what I’d do if someone handed me $3,000 with the condition that I spend it on something bike-related. Here’s my answer … and I’d love to hear yours in the comments. 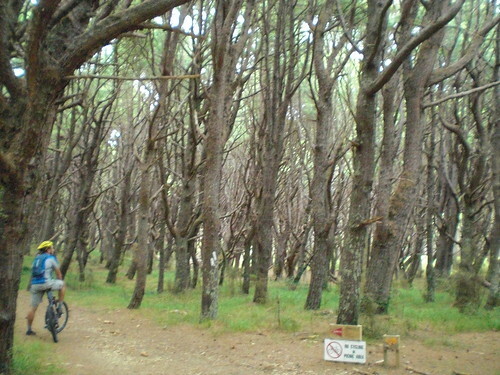 Check out the trails near Auckland. The last thing I’d spend my money on is another bike. I have two great bikes. And great as they are, they’re not the endgame. They’re the means to the endgame of great experiences. So I’d seek a great experience … I’d travel to New Zealand and ride the trails near Auckland and Rotorua, which has great scenery and riding. I’d love to include Queenstown, but that would eat away at my budget and time. First step: Find a flight from Phoenix Sky Harbor International Airport. This overgrown regional airport has one intercontinental flight per day. But Hawaiian Airlines recently started service from Honolulu to Auckland … and Hawaiian flies direct from Sky Harbor to Honolulu. I can skip the Los Angeles International Airport chaos and still travel to New Zealand. And I’d get to spend about a day hanging out in Honolulu before my connecting flight to Auckland on the outbound flight. Some people might like to split the trip into two flights, but I love long flights. A bonus – I’d finally get to fly Hawaiian Airlines, which has a reputation as one of the best U.S. carriers. But I’d be deprived of a flight on the Air New Zealand 777, which is one nice airplane. The Hawaiian Airlines bottom line is too attractive to pass, though: $1,212 for a round trip leaving Dec. 4 and returning Dec. 17. You can rent a Yeti 575 in New Zealand – not a bad ride! This is late spring/early summer in New Zealand – peak season! My standby, Anns Volcanic, was booked for weeks around my proposed date. But the YHA Rotorua website shows all sorts of options. A room with double beds and a private bathroom (“ensuite” in the local parlance) is $44 NZ. I should be able to match that rate at a similar hostel in Auckland, which also has great trails. That’s $550 NZ. And with the exchange rate? That turns into $465 US. Tack on $100 for a basic hotel in Hawaii during the layover, and that’s $565 US. That leaves bike rental … or bike hire, as it’s called in New Zealand. Hardtails are around $60 NZ a day, with dualies as high as $150 NZ. There’s a place that rents Yeti 575s from $75 a day. Factor in a price break for multi-day rental, the occasional day off the trails and I came up with a conservative budget of $541 US in bike rentals. That’s based on eight days of rental out of 11 full days on the ground. The days off are for other fun stuff like hiking, loafing and local flavors of adventure sports like the Zorb and Schweeb at The Agrodome, one of my favorite places ever. Total? $2,318 US – with cash left over for meals, transportation and visits to places like the Agrodome. To me, this beats the pants off a new bike, even something as cool as a Foundry Broadaxe (and make no mistake, it’s pretty sweet). Every bike wears out or gets less cool as new products roll out. But awesome days of adventure? They live forever.